Being recognized by the Superior Court in Kiel as an Official Interpreter/Translator, I have the authority to translate and authenticate documents, correspondences and ordinary letters. 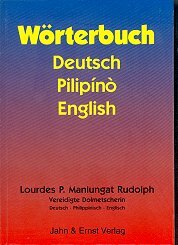 I am in a position to translate or interprete simultaneously from German to English Language and Tagalog civil ceremonies, contracts, judicial processes, judicial hearings and interrogations of witnesses or the like. Just send me an E-mail, a short message or simply call me by phone. * This Book is the first of its kind worldwide! * It is a limited, artistic rare Edition! This Book was introduced on October 5 - 10, 1994 during the International Book Fair in Frankfurt, Germany. It covers estimately 23,000 translated words which is printed on 300 pages. This Life Work will further be existing, as long as the human being who are speaking this language are living, thus, hundreds of years. That is the reason why I want to dedicate entirely and wholesome, this specially skilled book to my children: Alexander, Benjamin and Stephan! With the hope, that they let the further edition of this initial work be published, way out to the legitimate next generations of our family. I dedicate this Life Work too, to my beloved parents, who died already long time ago. I would not be in this situation where I am now, without them. I owe my whole life to my parents. In this way, I want to sincerely thank my husband Achim Rudolph for his untiring support. My heartfelt gratitude also to my parents-in-laws, Theo and Edith Rudolph, who were always ready in helping me and my family. Lastly, my thanks to my niece, Virginia Semmler, who was always ready to act, whenever I needed her help, in matters of tagalical expressions. Being a mother of three children, as free-lancer Official Interpreter/Translator and as 1st Chairman of a German-Philippine Association in Kiel until 1995, it was not easy for me to coordinate my time. But through the help of my beloved family circle, I was able to have my lifework be materialized. All rights reserved, specially the trilingual translations of the Edition, storage on Electronic Data Processing Systems, Screening, Radio broadcasting and Telecasting on Television as well as every sort of photo mechanical reproduction, also epitomes!